Brothers and Sisters, is Jesus enough for you? Are you satisfied knowing and trusting and being united with Jesus? Is he enough? And is he enough when it comes to loving and serving and ministering to others? Is he enough and do we trust him to empower and equip us to fulfil those two basic commands we recite every week. Will he, through his indwelling Spirit, prepare our hearts and equip us to love God with all our heart, soul, mind, and strength and will he prepare and equip us to love our neighbours as ourselves? Or do we think we need more or something else? I was thinking about this the last couple of weeks as I’ve been studying Exodus, but also because a friend, with a troubled look on his face, handed me a book and asked, “Would you read this and tell me what you think, because it doesn’t feel right to me.” And the book, written by a pastor, follows a popular secular trend that has overwhelmed the North American Church over the last few decades. It’s about the need for self-love and self-care and says that if we don’t have these things or haven’t mastered them or removed all the toxic situations and toxic people from our lives—ultimately, if we fail to believe that we are the great and supremely loveable people that we truly are—we’ll never be able to love God and love neighbour and we’ll never be able to do the great things God has in store for us. In other words, this philosophy says that to love God and to love neighbour, you must first know your worth and love yourself. But are these ideas Christian? Are they biblical? Are they rooted in what God himself tells us about ourselves? Do they have any relation with how God deals with us? Our passage today from Exodus is supremely relevant. You’ll remember that we left off last week at Exodus 2:10. In the midst of Israel’s oppression in Egypt, a baby was born to a Levite family. To protect him from Pharaoh’s order that all the baby Hebrew boys be drowned in the Nile, his mother hid him—ironically—in the same Nile River. But, we saw, the Lord had plans far beyond a mother’s desire to save the life of her son. The hidden baby was found by Pharaoh’s own daughter, who unwittingly gave him back to his mother so that she could serve as a wet nurse. When the baby was weaned, he was brought to the palace and adopted by the princess, who named him Moses. As I said the last two weeks, God hasn’t been named so far in Exodus, but we see him at work in every turn of the story. And it highlights the fact that in his perfect wisdom and goodness, God often works in ways we can never anticipate or expect. That’s something to remember when our culture is telling us that in order to be somebody or to accomplish something, we first have to be confident in ourselves. Dear Friends, the important thing is that we be confidant in God. Verse 11 picks up the story some years later. Moses has grown up. In his sermon in Acts 7, Stephen says that this event happened when Moses was forty years old. We’re told later that Moses was eighty when he confronted Pharaoh and that he was 120 when he died. The Old Testament loves round and figurative numbers, so this might just be a literary device to break Moses’ life into three equal forty-year segments. Or it might not. I’ll take is as literal for now. Really, forty used to seem old, but now that I’m closer to fifty, it doesn’t seem that way anymore. We’re not told anything of Moses’ upbringing. It would be great to know what his relationship with Pharaoh was like. Presumably, at least the royal family knew that he was a Hebrew and grudgingly accepted him. It’s pretty clear, as the story unfolds, that Moses received a royal education in the Egyptian tradition. The story, though, is short on details. Did he identify with the Egyptians? Or did he identify with the Hebrews? The story certainly seems to indicate that Moses was an outsider amongst both peoples. We see him now, an adult, going out to see his people. He goes out to see them with the standing of an Egyptian and a member of the royal household. Was it the first time? The Bible gives us a pretty clear sense that Moses knew who and what he was as he grew up. But was this the first time he actually saw the condition of his fellow Hebrews? It’s one thing to know about something; it’s another to actually see it for yourself. I can’t help, at this point, but remember that scene in Amazing Grace, the movie made a few years back about the life of William Wilberforce. It was one thing to tell fellow members of Parliament about the evils of the slave trade. But only hearing about it left it all hypothetical. So Wilberforce tricked his fellow MPs into taking a ride on the Thames one sunny day and then ensured that their boat sailed alongside a slave ship so that the could see those evils for themselves. Seeing it for yourself turns the hypothetical into reality. It’s harder to ignore what you’ve actually seen. 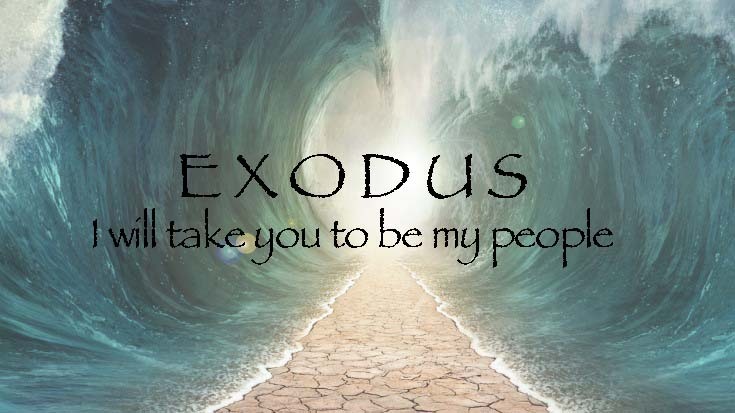 The writer of Exodus has already, in Chapter 1, stressed over and over the back-breaking oppression the Hebrews suffered at the hands of the Egyptians. Picture Moses going out to watch. Imagine a construction site or a brickyard. And overlooking the scene, Moses sees the oppression of his fellow Hebrews. Maybe this wasn’t the first time. Maybe he’d been going out for months or years and wrestling with it—trying to figure out what he might do from his vantage point in the royal household. Considering Pharaoh’s hostility to him—we’ll see that in a minute—it’s not hard to imagine that Moses had already been lobbying him on behalf of the Hebrews. But this time it’s not just the back-breaking labour that Moses sees. This time he sees one of his own being beaten by an Egyptian. It’s too much. Moses looks around, sees that no one’s watching, strikes and kills the taskmaster, then hides the body in the sand. The way the story is told and the choice of vocabulary anticipates the Lord’s judgement on Egypt when he kills the firstborn sons and drowns the army in the Red Sea. The same Hebrew verb is used here of the Egyptian striking the Hebrew slave, of Moses striking the Egyptian, and then of God striking Pharaoh. Moses anticipates the Lord’s judgement. There’s a hunger in his soul to see justice done. There’s a hunger in his soul to see his people delivered. And yet the time is not right and Moses is not ready. The drive and hunger for justice are there, but Moses is taking action on his own initiative. That’s not how God works. Moses is ready to take charge, but his people aren’t ready to let him. They knew who he was. And as much as Moses is identifying himself with the Hebrews, they still see him as an Egyptian. I expect many resented him. While they were living under the lash, Moses was living the high life in the palace. He stinks of the royal court. Moses wants to take charge, he wants to be the deliverer of his people, but he has no credibility with them. I’m reminded of a man in our church in Portland who had been homeless several times. Periodically he’d spend a few days or even a week, homeless by choice and living on the street, just so that he could tell people about Jesus. I asked him once if he’d take me with him. I was surprised when he said, “No way! Absolutely not! You’d harsh my vibe. No one would listen to me. You’re a rich kid and they’ll see you a mile away. You’d kill my credibility.” Something like that’s going on with Moses. He’s one of them, but he’s not one of them. He may have watched their oppression from a distance, but he hasn’t experienced it. Moses tries to take charge—again, anticipating his calling—but these men aren’t having any of it. “You aren’t the boss of us! You’re not our prince! You’re not our judge!” And, again, the scene anticipates the future. Moses’ ministry as Israel’s deliverer—when that time finally comes—will be a constant struggle against rebellion and rejection. God will do amazing things—he’ll send plagues on Egypt, he’ll drown Pharaoh’s army, he’ll provide water and then bread in the wilderness, and the people will praise the Lord and they will hail Moses as their champion—and five minutes later they’ll be cursing him. It’s worth noting that in this, too, Moses anticipates and points to Jesus, the ultimate Deliverer, rejected by his own people who shouted out for his crucifixion. In the story of Moses we see a pattern that shows us how God works—and, again, it's often not what we would expect, especially not if we’re listening to pagan culture more than we’re listening to the Bible. Again, there’s a passion for justice in Moses’ heart. He watches as these seven girls arrive to water their sheep. Some shepherds then arrive at the well and, instead of drawing their own water, try to chase off the girls. Moses sees this happen and doesn’t sit idly by. Presumably, these rough shepherds figured that, being just one man, Moses wouldn’t dare to challenge them, but that’s just what he does. And he saves the day. The funny part of the story is that the girls are so excited and so eager to tell their father what happened that they completely forget their manners and leave poor Moses at the well as they run home. Their father, a priest, who is called Reuel here (and in other places Jethro) is appalled at what they’ve done. “Where is this man?” he asks them. “Why’d you leave him there instead of inviting him to dinner?” Remember that hospitality was everything in ancient culture. Probably because of his clothing or maybe his accent, they had recognised he was an Egyptian—someone of culture. Reuel asks, “Why didn’t you invite him to dinner? He’s going to think we’re a bunch of barbarian ingrates!” And so he sends them back to Moses with an invitation. The Lord heard the cry of his people. Remember what I said last week: “Election entails completion; what God elects to do, he does.” God will not abandon his people and he will not abandon his plans. Think back to the covenant with Abraham and the animal carcasses laid out in halves. The Lord was saying to Abraham, I will make you a nation, I will give you this land, and I will make you a blessing to the nations, and should I not uphold my end of the covenant, may I be cut in two like these animals. The point being that the Lord is faithful. He does what he says he will do. He keeps his promises. But he does so in his timing, not ours. The deliverer is here. Now he’s pushing eighty. He was ready to take action at forty, but the time wasn’t right. But more important than the time was the man. Moses had the desire to deliver, but he didn’t yet have the character to be the Deliverer. He was ready to do it on his own, but that’s not how the Lord works. Notice, the Lord heard the cry of his people. What did he do? He took the Deliverer from the palace and from his place of privilege and drove him into the wilderness, where he became a humble shepherd. What’s up with that? Dwight Moody famously said of Moses, “[He] spent forty years thinking he was somebody; forty years learning he was nobody; and forty years discovering what God can do with a nobody.” It’s not that God didn’t leverage Moses’ gifts and personality and even his royal connections in Egypt. God used all those things. But Moses only became useful when he was no longer full of himself and when he was no longer trying to be the Deliverer in his own strength and wisdom. It’s a pattern we see over and over in the big story. Abraham had to leave his people and his land to meet God in a strange place. Proud Jacob had to driven off by his angry brother to a place where he was used and abused, before he became humble enough to be used by God. The nation Israel will have to spend forty years in the wilderness learning humility and reliance on God. And even Jesus will spend forty days fasting in the wilderness, tempted by the devil, but humbly submitting himself to the will of his Father. The humility of Moses points to the character of both Jesus, the Redeemer, and to us whom Jesus has redeemed. Humility is a struggle. It always has been. That’s why it so often takes the wilderness to bring it out. I think it’s especially challenging today. On the one hand we know that humility is a virtue our Lord exemplified and we know we should show it too, but we’re an incredibly self-absorbed people. It’s our culture and that culture has had a powerful influence on the Church. I think, again, of the book my friend asked me to read. The basic premise—and this was coming from a pastor—is that we must first learn to love ourselves before we can love God and love our neighbour. We must first learn to care for ourselves, before we can serve God and serve our neighbour. Before we can do things for God, we must be confident in ourselves. But this doesn’t come from the Bible. This comes from secular psychology, from the work of Adler and Maslow. Maslow developed the pyramid most of us have probably seen and a “hierarchy of needs”. Before you can start thinking about loving others (including God), Maslow said, your baser needs have to be met: physical needs, then needs for security and safety, then friendship and belonging, and finally self-esteem. Only then can we love God and others. The problem is that this is the opposite of what the Bible teaches us. It tries to add a third commandment to the two great ones: love yourself. In fact, it makes the two great commandments, love of God and love of neighbour, dependent on it. Brothers and Sisters, what does Jesus tell us? In the Sermon on the Mount, in Matthew 6, he reminds us his Father’s care for the bird and for the flowers. They don’t worry about food or clothing. The pagans, who don’t know the faithfulness of God, worry about those things. And so Jesus says, “Seek first God’s kingdom and God’s righteousness—seek first to love God and to love your neighbour—and all these other things you need will be added unto you. Seek first the things of God and God will take care of the rest. You see, the problem isn’t about self-esteem or a lack of it. It’s not self-love or self-loathing. To be focused on loving ourselves is the opposite of humility, but so is to be self-loathing. Either way, we’re focused on ourselves. In contrast, humility is selflessness. It is the character of Jesus who not only humbled himself for our sake, but gave his very life for our sake. Instead of learning to love himself, he thought nothing of himself. Instead of trying to care for himself, he gave himself to his last breath. Instead of developing confidence in himself, he was confident in the faithfulness of his Father. Instead of cutting the negative and toxic people out of his life, he died for their sake and with his last breath prayed for them. As his people, we are called to follow Jesus in this sort of humility. St. Paul writes in Philippians that we are to have this very mind, this very character ourselves. It doesn’t come naturally. We want to do big things for God. We think we can do big things for God. We often have very specific ideas of what we’re going to do for God and just how we’re going to do it. And, time and again, God drives us into the wilderness and there he reminds us that it’s not about us. Every time we think, “I am enough!”, God drives us into the wilderness and teaches us that we can never be enough. Jesus is the one who is enough for his people. And then, as our character conforms more and more to that of Jesus, just like Moses, we become useful to God. The more we set aside ourselves, the more we set aside our plans, the more we submit in humility to the wisdom and goodness of God, the more we’re ready to submit ourselves to his will—that’s when he works through us most powerfully. As he does every week, the Lord prepares his Table and offers us these gospel tokens of bread and wine. And yet the liturgy reminds us that we come to the Table the same way we come to Jesus in the first place: in humility and in repentance. “We do not presume to come to your table, merciful Lord, trusting in our own righteousness, but in your manifold and great mercies,” we pray. Why? Because “We are not worthy so much as to gather up the crumbs under your table.” We are sinners. We are idolaters. We are rebels. Brothers and Sisters, we need this reminder. We need to be taken into the wilderness to be humbled. Because only then do we fully appreciate that he is “the same Lord whose nature is always to have mercy.” He will make us clean by the body of his Son and he will wash us with his most precious blood. And we who were once his enemies—and who can humble acknowledge that and repent—may then “evermore dwell in him, and he in us”. Amen. Bruce Waltke, An Old Testament Theology (Grand Rapds: Zondervan, 2007), 353.